Prepper Talk Radio Episode 59, 11 16 16 Are you conflicted? This show was a lot of fun for us. Asking hard questions and trying to come up with the right answers is a great task that everyone should take time to do. 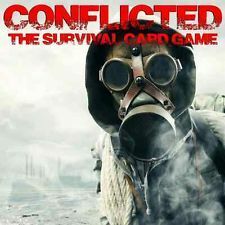 The game is called "Conflicted". Each card asks a different situational questions about what you would do in a particular scenario. I highly suggest that you pick up a deck and start asking yourselves difficult questions. If you have already made the decision before the situation arises you'll be far better off.